U Can't Anvil The Truth: Tower Of Human Skulls...Decoded Picture Tells All You Need To Know!!! Tower Of Human Skulls...Decoded Picture Tells All You Need To Know!!! 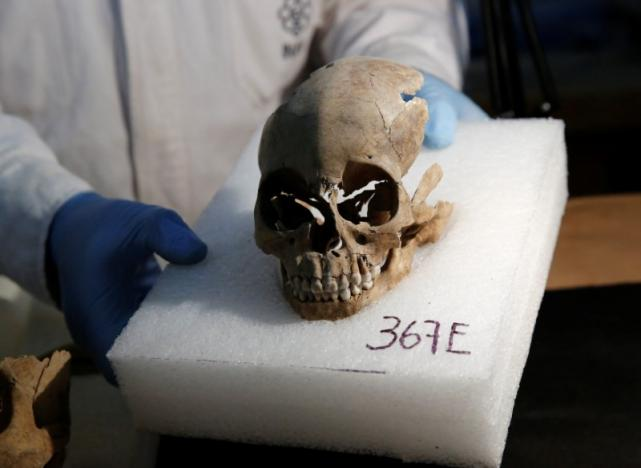 A tower of human skulls unearthed beneath the heart of Mexico City has raised new questions about the culture of sacrifice in the Aztec Empire after crania of women and children surfaced among the hundreds embedded in the forbidding structure. Archaeologists have found more than 650 skulls caked in lime and thousands of fragments in the cylindrical edifice near the site of the Templo Mayor, one of the main temples in the Aztec capital Tenochtitlan, which later became Mexico City. The tower is believed to form part of the Huey Tzompantli, a massive array of skulls that struck fear into the Spanish conquistadores when they captured the city under Hernan Cortes, and mentioned the structure in contemporary accounts. Historians relate how the severed heads of captured warriors adorned tzompantli, or skull racks, found in a number of Mesoamerican cultures before the Spanish conquest. But the archaeological dig in the bowels of old Mexico City that began in 2015 suggests that picture was not complete. "We were expecting just men, obviously young men, as warriors would be, and the thing about the women and children is that you'd think they wouldn't be going to war," said Rodrigo Bolanos, a biological anthropologist investigating the find. Metropolitan Cathedral built over the Templo Mayor, said the skulls would have been set in the tower after they had stood on public display on the tzompantli. Roughly six meters in diameter, the tower stood on the corner of the chapel of Huitzilopochtli, Aztec god of the sun, war and human sacrifice. Its base has yet to be unearthed. Spanish soldier who accompanied Cortes in the 1521 conquest of Mexico, Barrera said. In his account of the campaign, de Tapia said he counted tens of thousands of skulls at what became known as the Huey Tzompantli. Barrera said 676 skulls had so far been found, and that the number would rise as excavations went on. The Aztecs and other Mesoamerican peoples performed ritualistic human sacrifices as offerings to the sun. A picture is worth a hundred decodes as you can plainly see that the skull and the number 367E decoded reveals that this archaeological dig is a complete hoax.